Daily brushing and flossing are two known parts of proper oral hygiene. However, regular flossing also has a positive effect on your overall health. Since the mouth is the door to your body, it is important to take care of your teeth. Here are a few reasons flossing should be part of your general hygiene routine. 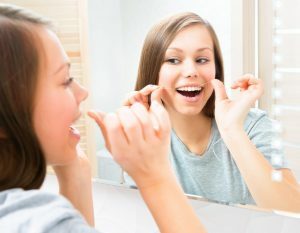 Flossing is the best way to remove debris that becomes lodged between your teeth. When it is left to accumulate, bacteria thrives as plaque grows. These deposits may contain over 700 strains of bacteria, which can lead to gingivitis. When this occurs, gums swell and bleed during brushing. As gum disease progresses, the inflammation can affect you jaw and teeth. As swelling begins in your mouth, it can quickly lead to heart problems. Inflammation in your mouth can trigger inflammation through your entire body. Scientific studies have shown oral bacteria may enter the bloodstream and create clots, which can cause heart attacks. When inflammation occurs in the mouth, it may impair your body’s natural ability to properly metabolize glucose. This can lead to obesity and diabetes. Maintaining good dental health and solid oral hygiene makes it easier for diabetics to control sugar without the need for pharmaceutical intervention. Like the heart and other organs, inflammation affects your blood vessels. As arteries become narrow, high blood pressure becomes a problem. Hypertension often causes poor circulation in the arms and legs. Without proper body circulation, it is possible to suffer from impaired mental function as well. No matter the time of day, The American Dental Association, explains how flossing is a crucial part of hygiene. The organization recommends guiding floss between your teeth in a gentle rubbing motion. At the gum line, the floss should be curved and slid between each tooth in an up and down motion. For more tips and information about what oral care products will work best to improve your overall hygiene, visit your dentist. This professional will examine your mouth for signs of problems and demonstrate the proper flossing method to maintain a beautiful smile and positive health.